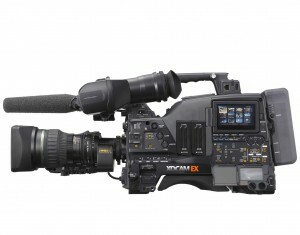 Personally am waiting for the EX9 in 2011 which has 14 SxS slots for ultra continuous recording. Also has a P2 “sleeve” if you want to use your old P2 cards in the SxS slots. Also has built in optical stabilizer made for Sony by Tiffen that replicates identically the Steadicam look off your shoulder. Personally this is all a bit pointless for me as I have decided to sever my ties with Sony, sell all five cameras I have of theirs, as I think the picture quality of them is a bit rubbish. I have now been bought up, I mean, signed an exclusive deal with Nokia to shoot everything from now on using the N96. I hope you all do the same. Works great with the Letus Ultimate and a 7mm adaptor ring. Zacuto are already hard at work on a rig for this, should be out in time for NAB. The giveaway was the honest to god shoulder mount improved ergonomics designed for a real world video photographer. Sony would never do that! so why are all there 350s 700s 450s etc even numbers?! Haha, you totally got me. “I’ve smelled that aftershave before… and both times I’ve smelled a rat.” –007 to Mr. Kidd in Diamonds are Forever. Do you know if the EX7 has overcranking options other than the maximum 60fps of the EX3? You should buy Pana 3000…..